A family determined to get their young daughter into the finals of a beauty pageant take a cross-country trip in their VW bus. Eccentric and dysfunctional ‘everyone pretend to be normal’, they learn a lot about themselves, life, and their family during the journey. The result is a funny and heartwarming story of hope and dreams. 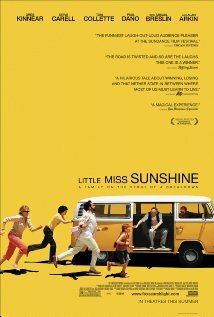 Little Miss Sunshine received critical acclaim and had an international box office gross of $100.5 million. The film was nominated for four Academy Awards, including Best Picture, and won two: Best Original Screenplay for Michael Arndt and Best Supporting Actor for Alan Arkin. It also won. In addition, the AFI Awards deemed it the “Movie of the Year”, while the BAFTA Awards awarded it two awards out of six nominations with “Best Screenplay” for Arndt and “Best Actor in a Supporting Role” for Arkin. The Broadcast Film Critics Association Awards, Screen Actors Guild (SAG), and Washington D.C. Area Film Critics commended the film for its ensemble cast. Then 10-year-old Abigail Breslin was nominated for several Best Supporting Actress and Breakthrough Performance awards. The Deauville Film Festival awarded the film the “Grand Special Prize” while the Palm Springs International Film Festival awarded it the “Chairman’s Vanguard Award”. The Independent Spirit Awards awarded it four awards out of five nominations, including “Best Feature” and “Best Director”. The film’s soundtrack was nominated for “Best Compilation Soundtrack Album for Motion Picture, Television, or Other Visual Media” at the Grammy Awards, but lost to Walk The Line. The film also had multiple nominations at the MTV Movie Awards, Satellite Awards, Chicago Film Critics Association Awards, and Golden Globe Awards, among others. Paste Magazine named it one of the 50 Best Movies of the Decade (2000–2009), ranking it at #34. A musical based on the film, with music and lyrics by William Finn and book and direction by James Lapine, premiered at the La Jolla Playhouse from February 15 through March 27, 2011. Whilst the zombies drag themselves about and the world is coming to an end, I want entertainment that is funny, hopeful and heartwarming. A good, solid story, with an excellent soundtrack compilation, and lots of laughs. The end scene with Olive dancing at the beauty paegent is classic. As always Toni Collette again re-inforces why she is one of my favourite actresses. Her portrayal of the family’s worn out Matriarch, won her nominations for both BAFTA and Golden Globes. It is on this basis, that I hereby put forward my recommendation of Little Miss Sunshine for my Bunker nomination.